In recent years, the normalization of hate speech throughout Europe has contributed to the radicalization of individuals and collectives against the Other, fueling hate crimes towards marginalized groups. From everyday discrimination and stigmatization to direct attacks on women, LGBTQI+, Roma, migrants, and minority faith communities on social media, the hate narrative gradually translated into violence, weakening the social cohesion between communities and further threatening democracy, equality and the rule of law across the continent. What are the various forms hate speech is taking? What are the causes and consequences of hate speech at the individual and societal level? How is hate speech regulated in Europe? How does hate speech impact human rights and democracy? What can be done to fight against hate? 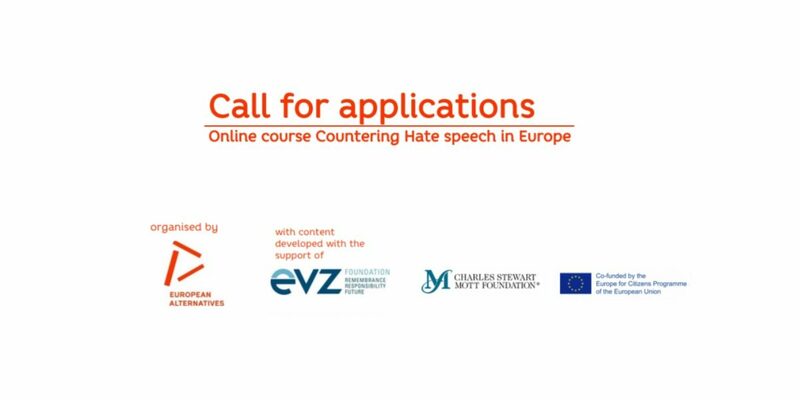 Through Virtual Exchange, participants will put their own experiences, values, and challenges in the forefront as a primary source for learning and application about hate speech in Europe. The course is open to anyone between 18 and 30, and residing in one of the Erasmus+ programme countries or Southern Mediterranean countries. Availability for the same 2-hours throughout the whole duration of this 6-week course, to participate in online sessions-Have 1-2 hours to invest in various assignments that support you explore the weekly topic. The course is of special interest for activists, students and passionate citizens from all over Europe and the Southern Mediterranean who want to get a deep insight into hate speech. Based on a human rights perspective, the course explores these questions and the actions that can be undertaken to effectively counter hate and promote open societies. Before applying read the call carefully (https://euroalter.com/wp-content/uploads/2018/10/Call-for-Applications-Online-Course-Chs-3.pdf) and apply online here (https://exchangeportal.net/registration-disclaimer/tp-student/spf). The deadline for applications is midnight on October 28th, 2018.